Is this election about who is the least unacceptable? There are two main contenders for the post of PM. Narendra Modi has already declared himself, rather pompously, the winner of this election. The other is Rahul Gandhi. There are of course, a number of people who hope they will be able to contain the BJP enough to not be able to have the numbers to be able to form the government. Arvind Kejriwal, Jayalalitha, Mayawati, Mamata Bannerjee and others genuinely believe that the BJP will not have the numbers and they will then have a realistic shot at Prime Ministership. Strangely, I have not yet made up my mind on who I will vote for this election. I have strong reservations against each of the contenders. Narendra Modi is currently the flavour of the season. It is considered rude, at least in my circles to say anything against him. Say one word against him and almost everyone around me protests. People against Modi say that we cannot trust him as PM. If ever there was a situation that demanded that he be genuinely fair when it comes to Muslims, given his past record, we can never be sure what he will do. I do not believe that to be a problem. I do not believe he will do anything that is unfair to Muslims after what happened in Gujarat. My real problem is that he did not do enough in Gujarat and willingly allowed / actively egged on the rioters, depending on your position on 2002. I believe that someone who is the Chief Minister of a state has the responsibility for making sure things like this do not happen. I do not want to vote for someone who at the very best, abdicated his responsibility entirely and at the very worst, carried out the worst pogrom we have seen in India. Retribution is my main reason. Coming to the Congress, the corruption that they have institutionalised in the last ten years, the lackadaisical Prime Minister in Manmohan Singh and the thoroughly uninspiring PM candidate, Rahul Gandhi have probably thrown the Congress out of reckoning even before the first vote has been cast. Even senior leaders are looking for excuses to not contest these elections. No one is really sure about the impact the Aam Aadmi Party and its maverick leader Arvind Kejriwal will have. I don't think anyone, even the AAP, believes that they have any chance of getting enough numbers to form the government, even with the support of others. But they will end up having a few seats and after May 16th, when counting is done, nothing will be impossible! Arvind Kejriwal had things going well for him until he formed the Delhi government. Sadly, he lost his way almost completely after that. He has squandered a golden opportunity at providing a genuinely honest alternative to the Indian people. I however believe that all is not lost. If he and his team mellow down, works within the system and stop shooting from their hips, they might still be able to gain the confidence of a larger number of Indian people. The other candidates will find it very difficult to provide a stable government like in the past. This brings me to the issues. At the end of the day when you do not have great leaders leading the teams, you go by the issues that are close to your heart. Most people have some issues which they consider important for them. They finally end up voting based on these issues. I have a few issues close to my heart. I might end up voting based on these. One other option, espoused by good friend Kartik Thum, is that you should vote based on the candidates that are contesting from your particular constituency. Don't worry about who is the PM nominee. The Indian democratic system was designed for the voter to elect the local MP and then the MPs elect the PM. Let us be true to that system and elect the candidate we feel is the best for our constituency. This makes sense as well. I might end up doing that as well. I still don't know who the candidates are though. Once they are announced, I might actually do what Kartik suggests and vote for the best person in my constituency and leave the rest to him or her! 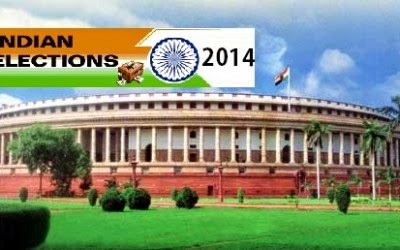 Last 10 years Congress was running the government and they had very good MPs however Corruption/scams increases, no development/growth, inflation, riots in many states for ex: UP, Assam etc...,farmers sucides, communal politics etc...i think these problems cannot be solved by our constiuency MP alone. Having a good PM (Leader/Captain) makes a huge difference and even with average MPs country will prosper. In my view country should come first then state and then region. What if we don't have a good captain? That is the situation we are faced with today. As I said in my post, we have to choose among three or more candidates who have a major drawback each. Consider our state, I mean Telangana :p - luckily you have a choice here even if you want to see Modi (or say Rahul) as the PM. Considering the above options, now looks at who their candidates are, you have 3 weeks to evaluate and decide on who is better among them. I doubt if it is that simple Kartik! You mentioned TRS for all three options. You also mentioned Congress in the 2nd and 3rd options. Not sure what you're logic is here. Can you please elaborate a little? Also, my constituency candidates are not even announced! My point is pretty simple, take the probability of each of your candidates voting for your choice of prime ministerial candidate. Based on that, pick the few who you think could vote for Modi/Rahul/Kejriwal, and then among them choose the person who won't leave your roads and amenities unattended - else you won't have any right to complain about the road in front of your house for the way it is, Modi/Rahul have no direct stake in it, they are too busy with the macro picture, and in fact they might have even sanctioned the money for your road but your MP might be least bothered! Yesterday was the last day for filing nominations, so all your constituency candidates have already been finalized and declared. Congress messed up big time with your assembly candidate. They initially announced Krishank, a promising leader from OU-JAC, and changed it in the last minute, choosing Gajjela Kantham instead. TDP+BJP has fielded Saianna, and TRS has Gajjela Nagesh. From what I know, if you want to vote directly for Modi, you might most probably end up voting for LSP's JP in your constituency (of Malkajgiri). This is because there seems to be a tacit understanding among the three parties even though there is no official alliance between BJP-TD and LSP. TDP has intentionally placed a very weak candidate (Malla Reddy) as part of the BJP-TD alliance, to make sure JP has his share of votes - this IMHO is sheer caste politics which TDP knows better than anyone else, but I could be wrong! Other candidates include the incumbant Sarvey Satyanarayana from Congress, and Hanmanth Rao from TRS. That's a very poor choice I am presented with! For both assembly and the LS. I was very surprised to know from you the Lok Satta would indulge in this kind of caste politics. Who would you vote for if you stayed where I do? Is your LS constituency also Malkajgiri? My constituencies are Khairatabad (Assembly) and Secunderabad (Parliament). I have a simple way of looking at this, but this might not apply to your goals - I need representatives who can represent the new state in a proper way, someone who can be strong enough to bring in the goodies. Over the next few years, politicians from AP will try their best to continue to hand hold the politicians here (consider BJP's forced alliance with TDP, in spite of all BJP district presidents threatening to resign). So, for me BJP/TDP, YSRCP & LSP are big NO. YSRCP has no presence here so I won't bother about it (just in case you want to consider, our former DGP Dhinesh Reddy is on YCP ticket from Malkajgiri but he isn't clean as far as I know). Based on this, I am left to choose from Congress and TRS, depending on the candidates. But this is based on my preferences and interests. Your way of looking at this could be very different. In my constituency I have only decided that I would pick Manne Goverdhan Reddy (TRS) over the incumbant Danam Nagender. This was simple. For MP, I am yet to decide between the incumbant Congress candidate (whose son slapped a constable recently) and Bhim Sen (TRS). As for your Assembly contestants, I am not yet aware of who is better. I would have picked Krishank had he been nominated by Congress. I would never go with Gajjala Kantham. G Saianna of TDP was your MLA from 2004 to 2009, so you might know something about him. Going through the FB profile of Gajjela Nagesh of TRS he is passable too. Just came to know that P V Narasimha Rao's grandson, who is a medical professional (blood transfusion related field), is also contesting from Malkajgiri on AAP ticket. May be another option to consider. https://www.youtube.com/watch?v=AHxuMh3NUoU - This is about JP and LSP (published a few hours back). I don't care about the corruption charges, but this definitely proves the BJP-TDP-LSP nexus, in Malkajgiri! Thanks Kartik for all the information. I will take a look at the video soon. Kartik, nothing against telengana. But why TRS MPs and MLAs will only do good and not TDP / BJP / Cong for the new state. Even I am surprised of JP, he was representing Kukatpally, now he is contesting in Malkajigiri. There should be something. However I have observed LSP doing good work in kukatpally, solving drainage, water problems. Also saw him sincerly pursuing to complete hi-tech city fly over, traffic problems. I guess it need not be him may be some passionate junior leaders. Jiten, as I said I am going to choose primarily between Congress & TRS. I never left out Congress, it will be purely on the basis of candidate between these two parties for me. AAP is another possibility too, again provided the candidate is outstanding (they are only contesting MP seats as far as I know), and I am yet to decide on my vote for the MP. I would have considered BJP had they worked like a democratic party, and listened to their cadre, which was against any alliance with TDP. In fact, all district presidents even threatened to resign if an alliance was forged with TDP. My issues with TDP & YSRCP, are obviously about making sure Andhra leaders don't make a way back into Telangana - that was the whole purpose of Telangana state, isn't it? As far as LSP is concerned, in 2009 (though I was away in US at the time of elections) I had chosen LSP for assembly and Congress for parliament. It's only after learning enough about the way they work that I figured it wasn't the party they claim to be. Also, this might be far fetched, and I might be reading too much between the lines in a partial way, but here's something that I was considering - for LSP Delhi president's post, why did they choose a person with a name that's similar to Arvind Kejriwal? Are they seriously trying to confuse (at least a small % of voters) by fielding him against Arvind Kejriwal. This is a common strategy used by AP politicians, and we had seen a lot of this in the by-elections over the last few years. There was a case where TDP fielded 5 or 6 dummy candidates with a name similar to a winning candidate, just to confuse voters. Unavailable - someone can fill in if it exists. I have seen him as a panelist on several news channels, he is promising, but not sure if he can make it!